(The second in my 3-part series, "Wine... Doing It YOUR Way"). I've told the story before about how I came about owning a winery but never talked much about my wine experience or knowledge prior to getting into the business. So, I guess you can call this, "true confession time..."
Truth be known, when I started drinking wine in the 70's, I liked my reds served 'cold.' I was even known to use an ice cube or two to get the wine to the proper temperature. As I think about it now, the wait staff at the restaurants back then never even flinched or rolled their eyes when I asked for a 'cold' Merlot. I was never made to feel dumb about wine. The only problem was... by the time they got my wine cold, it usually ended up being served with my dessert! Not sure how that phase came about (maybe I watched too many Italian movies) but thank goodness I got over it fairly fast. Guess you could say my first real wine breakthrough was in the late 80's when I started buying 750 ml bottles instead of 1.5 liter 'jug' bottles. I was living in Dallas back then. I remember I'd had a particularly tough day at work and decided to stop by the liquor store for some wine. There was a new display of wine stuff that featured a t-shirt with the all too familiar saying... "Life Is Too Short To Buy Cheap Wine." Whatever, I ended up switching aisles -- from jug wines to racks of wine with lots of shelf talkers (you know those 2x3 cards that describe why you should pick that wine). I was soon overwhelmed with wine descriptions that were way over my head and in some cases sounded almost like passages from a romance novel (voluptuous, full mouth feel, lay this one down for a few years!). Yeah, right! But the shelf talkers worked... because it seemed I only bought wines with flapping tags and catchy phrases. Business dinners, travel and a few more dollars added to my wine budget helped expand my wine education further. At this point in my journey, I was not overly curious or particularly knowledgeable. I found a wine I liked and basically stuck to it unless something was on sale and I got adventurous. This is about when I knew enough to 'think' I knew something about wine. Got snobbish about corks vs. screw caps, swirled and sniffed before I tasted and started spouting wine speak (those shelf talkers gave me enough information to talk intelligently -- for about 10 seconds). I didn't stop there. Shortly, I was off to my first wine tasting vacation in Napa. I came home with a very expensive case of... you guessed it... Silver Oak Cellars Cabernet. I proudly displayed that wine in my new wine rack, both placed in my Dallas kitchen just under the west wall window (aka, the hottest spot in the house). It wasn't long before I noticed wine seeping from the capsules of the bottles. Of course, I had cooked the wine and most of it went bad; an expensive way to learn about the proper storage of wine. Years passed and I continued tasting and enjoying wines from around the world. It was during this time, while still at Texas Instruments, that I bought Olympic Cellars in 1999. I was traveling extensively with TI then and remember coming back from India once. I dragged onto the plane, tired and not looking forward to the 36 hour trip. All I wanted was a good glass of wine. I was in business class (none of those little bottles for me) and kept rejecting the wines the flight attendant served. Unfortunately, I was seated by my boss who by now was embarrassed and told me to "just pick one!" Had I become a wine snob? Nope, I just knew the style of wine I liked... BB&B (Big, Bold and Beautiful)! Obviously, my wine journey hadn't prepared me for running a winery. But it did mold my thinking and later my decisions on the wines we would eventually make here at Olympic Cellars. My wine journey had been just that... a journey. I could have stopped it at "Merlot over Ice" and that would have been okay because that was the style of wine I enjoyed. Remember, it's all about "Wine... Doing It YOUR Way!" PS. Next time, it's the third and final installment in this series. And it's my favorite story, "My Mer-Lot Couple." Don't miss it. I have laughed and can identify so much... thanks for sharing your "journey." Oh... 8/8... was great... Save a Horse... Ride a Cowboy ;)! Randi M.
Wnat a marvelous continuation of "My Wine Journey". I haven't had the opportunity to meet you, nor have I visited the winery. I will soon. 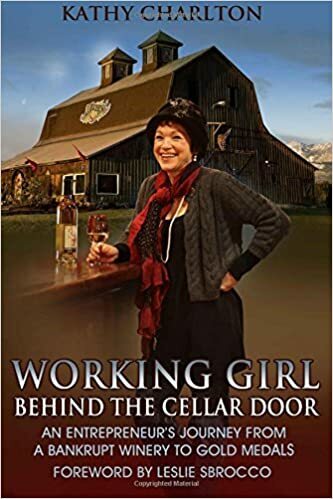 My first awareness of Olympic Cellars Winery was because I bought a bottle of the Working Girl here in Tacoma. The experience you shared with us regarding the beginning wine discoveries to current is one many of us can relate with. I hope to visit you soon. Thanks for your dedication and hard work.